After a long hiatus (precipitated by moving into an old Bruges row house and renovating it, along with creating a little painting studio for myself) I finally had the chance to get back into painting these last few weeks – and the weather has been great! 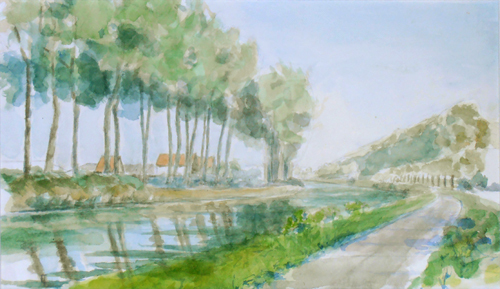 I decided to do an oil of a watercolor study I had completed in 2011 of the bend along the Damse Vaart canal outside Bruges. It’s a great perspective, particularly around mid-day. There are some interesting middle ground structures on the left, while on the right the receding treeline stretches almost all the way to Damme. The strong mid-day shadows complement the movement and function as an anchor. 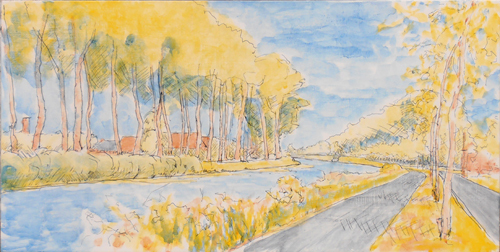 I transposed the basic composition of the watercolor to a panel, but decided to do the foundational ink drawing and egg tempera levels en plein air. For the ink level, I reverted to the stylus and nib quill-pen style of my youth, instead of the technical drawing pens I’ve been using ever since. I wanted to let the pen nib respond to my hand pressure with a thinner or thicker line, mirroring my response to nature. It worked quite well, except the ink jar fell over spilling most of its contents. Enough remained to complete my work, even if the drawing ended up being a little sketchier than I might have envisioned it. So I quickly moved onto the egg tempera stage. I brought three pigments with me pre-ground into pastes: cadmium yellow medium, alizarin crimson and thalo blue, in addition of course to the egg yolk. In future, I plan to mix up my paints with egg in the studio before going out – just to minimize the hassle: there are already enough uncontrollable factors to contend with in nature, like the wind, rain, sun and insects, why shoot yourself in the foot? In any case, I mixed up my paints in situ and laid in some washes over my ink drawing to indicate future color developments. Though it may not be very visible in the reproduction image here, I paid special attention to lay in more saturated colors in the foreground and lighter washes in the distance. I’ve learned from experience that it all makes a difference in the long run – any color, no matter how subtle equates to less light. After a week or so, the egg tempera level was cured enough to paint over. It dries immediately but don’t be deceived, the egg/oil combo also has to cure. Gentle UV light can help. I painted a toned imprimatura of burnt sienna over the piece. My purpose in doing so was to unify the disparate foundational parts and lay in a preliminary value study. Using turpentine, I extracted the imprimatura from the highlights and lighter quarter tones revealing the underpainting beneath, while painting a more saturated layer into the shadows. I did this in the studio and it came out quite well(!). Now it’s starting to get exciting. I let this level dry for almost a week. That’s not really necessary, at least if you don’t mind a little imprimatura bleeding into the next level of glaze, but since I did, I let it dry. Also, the shadowed areas were painted with a slightly heavier sienna wash, so they needed more time. I consider it an excellent start, though a little too coarse and graphic for my taste. I’d like to reintroduce the atmosphere of the imprimatura by softening a number of transitions and reintroducing the light. We’ll see if that’s possible. Fingers crossed for Bend in the Damse Vaart, part II.